Modular arithmetic was one of the greatest contributions to mathematics was made by Carl Friedrich Gauss. Gauss was the son of an accountant. Legend has it that by three years old Gauss was pointing out mistakes of his father, and by five, he was managing the accounts. At age seven, Gauss was instructed to add the numbers 1 through 100 as a punishment. He did this by pairing the numbers whose sum was 100 (100 and 0, 99 and 1, 98 and 2, etc.) and multiplied by the number of pairs. Gauss’ method of taking a large amount if number and grouping them into equivalent groups was just the start of modular arithmetic. where X-A is congruent to N*B where B is some integer. For example, in modulo 4, 11 is congruent to 3 because they both have a residual of 3 (3/4 is 0 remainder 3 and 11/4 is 3 remainder 3). Another way of stating this is 11 is congruent to 3 because they both have the same remainders. Furthermore, Euler developed addition and multiplication for these groups. He showed that two numbers must be multiplied for example, and then that product should be converted to the right congruence class. For example, let’s multiply 3 and 2 in mod 4. He showed that any two components that were multiplied from different groups should produce the same result every time. Here is another example to model this concept. As stated above, we know that 11 and 3 are equivalent in modulo 4. We also know that 6 is equivalent to 2 in modulo 4 from our previous results. So if we multiply 11 and 6 and we multiply 3 and 2, we should come up with the same results. 2 = 6 (mod 4). Thus, 11 x 6 and 2 x 3 are congruent in modulo 4. These discoveries were used by many mathematicians and are applicable to a wide variety of mathematical areas such as Cauchy sequences, topology, addition and multiplying large numbers, and much more. In her book, How to Bake Pi, by Eugenia Cheng, she states that a donut is topographically equivalent to a coffee mug. You might ask, in what sense or in what congruence class? The donut is congruent to a coffee mug in the sense that they both have one hole. The coffee mug may seem to have two holes (one as the handle and one where the coffee goes) but the place where the coffee goes is not actually a hole. It is a depression. This process is referred to as a homeomorphic. Consider a second example of congruent classes in topology which are homotopic (this means we can take something and shrink it). For example O is congruent to Q because we can take the little tale and shrink it to look like the O. If we take all of the alphabet, we can break it up into three congruence classes: letters with no holes, letters with one hole, and letters with two holes. In conclusion, the discovery of congruence classes and modular arithmetic is very important in mathematics because it allows us to larger group of numbers or items which behave the same and put them into one group and perform operations on these groups such as multiplication and subtraction. We can generalize and make more discoveries with less work in topology, algebra, space, and much more. Euler had a major influence on mathematics in that he developed new ideas and also extended existing ones. For example, he was the first to use e as the base of the natural logarithm, he was the first to come up with the idea of i, he developed with the power series of e… the list goes on. He made developments in a variety of mathematical areas: calculus, number theory, topology and also graph theory. 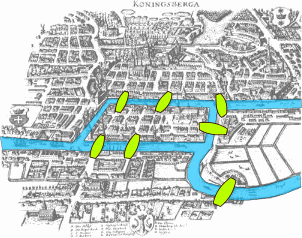 Specifically, he studied and found a solution to the following problem: Is it possible to start at a point and cross over every one of the seven bridges only once and end at the starting point? The first thing we do to solve this problem is to put into a different sort of map. We will represent each island by a vertex. The islands are the two areas which are surrounded by rivers. Consider the picture above. The first island is easy to find; it is directly in the middle. The second is the piece of land directly to the right of it. It is surrounded by rivers on three sides and the fourth side is basically the end of the picture; no river, no land therefore an its an island, I guess. Everything to the right of the island we will label with a vertex and the same for the left side. Next, Euler looked at how many edges or bridges run into each vertex. In number theory, we call this the degree of each vertex. 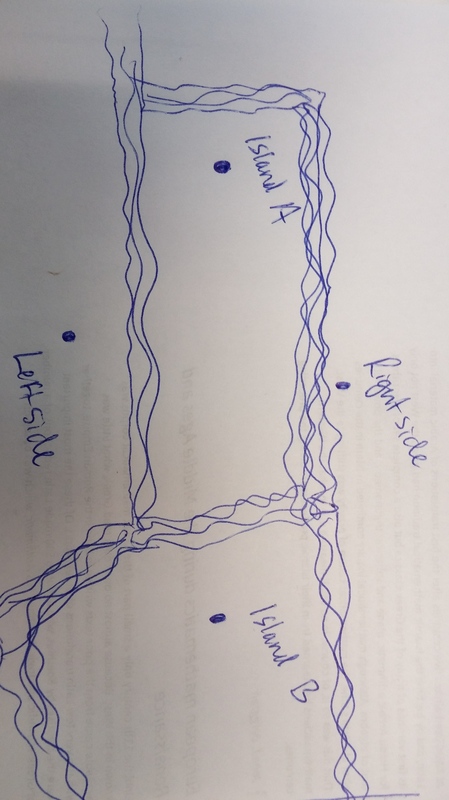 So the degree of the vertex labeled “Island A” is 5 because there are five edges which are connected to this vertex or five different bridges you could cross if you were standing on Island A. 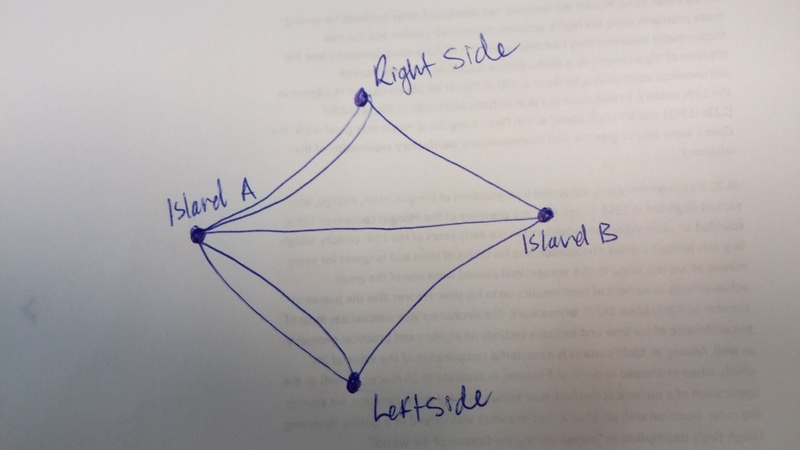 Similarly, the vertex labeled “Island B” has degree 3, the vertex labeled “Right Side” has degree 3, and the vertex labeled “Left Side” has degree 3. One thing that can be noted about the number of degrees for each of the vertices is that it is odd. We are looking for a path that starts at one vertex, goes through every edge only once and ends at the starting point. Euler called this a circuit, specifically a Euler circuit. Since every vertex has an odd degree, a Euler circuit does not exist according to Euler’s second theorem. In order for a circuit to exist, every vertex must be even. This is because if hit a vertex, we need to come out the other side. Once we travel on an edge, we can’t travel it again because of the nature of a circuit and because of the nature of this problem; We can only cross every bridge once. So we eventually run into the problem of going to a vertex but running out of edges to take going away from the vertex. For this reason, we need an even number of degrees of in a connected graph in order to have a Euler circuit. Eugenia Cheng’s How to Bake Pi was a pleasure to read. In her book, she talks about what math is, the nature of math, and category theory specifically. This book is very tangible and easy to read. Throughout her exploration of mathematics, Cheng often uses the metaphor of baking which I found very helpful. The beginning of the book starts broadly, answering the question, what is math. According the Cheng, “mathematics is anything that obeys the rules of logic, using the rules of logic.” She describes the two ways to do mathematics. The first is abstraction. This is where we find math in seemingly unmathematical ideas. The second is generalization – where we build on things we understand. In addition, Cheng notes that math seeks to make things simpler by noticing things which are the same, ignoring the small details. When we problem solve in math, it is crucial to be able to organize the information we have in order of significance. We need to be able to take reality, apply abstraction and bring it back to reality again. In order to prove something is true we use the mathematical method and use logic instead of evidence. In this sense, Cheng states “math is a world where the means justifies the end.” We use logic to justify our conclusions even if we can’t actually come to that conclusion using numbers. Similarly, we need to study exceptions and general bodies of behavior. Cheng points out that mathematics allows us to do this in a sense that we do not have to imagine them at all in order to study them. Next, Cheng talks about what motivates us to do mathematics. She states, “the best mathematical inventions are the ones that make internal sense and solve some existing problem.” Where solving an existing problem may be an external motivation, we need to continually ask the questions WHY? like small children and seek to be internally motivated. Cheng points out that we often accept truth on the grounds of higher authority. We assume that they did the homework, so why should we. But “one of them aims of mathematics is to do things from scratch.” Again, we need to understand the process, and when we do “math is easy”. There is no mysterious missing steps because each step of logic is connected to a preceding one. We have applied math and we have pure math. According to Cheng, “applied math could be thought of as the theory behind things in real life and pure math is the theory behind applied math.” Pure math is like building a complicated structure out of lego blocks (no wheel or windows). Category theory is given in pure math to group similar things in mathematics. We group things by studying the context they are in in order to learn more about them. So what allows two things to be in the same group? According to Cheng, “two things are the same if you can reverse the process to get from one to the other” (i.e. they are invertible). Category theory looks at the role a thing plays but it also looks at a role and see what plays it. In this way, category theory illuminates math and aids in our understanding. Finally, my favorite quote in Cheng’s book is the following: “Knowledge is power, but understanding is more powerful.” Mathematics is about logic and process, and understanding is key to its power. As a math major and accounting major, I sit in the perfect seat to reflect on the usefulness of understanding math in accounting. I have been asked the question “are math and accounting related?” and my answer is “absolutely”. Contribution margin per unit cancels and we are lefts with the number of units. That being said if we understand the algebra used here and we know the concept behind our accounting terms, we can break it down to the basics and understand what is happening in these equations. Accountants would set it up as follows. where PVF is equal to the present value factor. Even though in this case we have the end result instead of the initial information, the calculations are the same; multiplication is still used. This example above is a simple one, but it gets more complicated in accounting. We talk about bonds and annuities. Annuities are where we either add or deduct money from an investment throughout the period of the investment. Sometimes we wait 10 years before we start taking money out. These types of problems make for great math problems! When we use future value factors, or present value factors I think it takes the math out of it. It makes more complicated; it makes it more about memorization than actually understanding the concept. In this way, understanding the math in accounting makes accounting seem more simple because I am able to break it down to the building blocks. I don’t need to spend the time wrapping my mind around the math involved because I know what calculations are being done. I can focus on the concepts. In the various math classes I have taken, we have studied a wide variety of topics ranging from logic to tessellations. We talk about truth statements, we talk about patterns, we talk about shapes, and rotating shapes. We talk about distance, we talk about length, we talk about area, volume, statistics, calculus, infinity, graph theory, sets, etc. The list goes on. It may seem as though all of these subjects do not belong in one larger category. However, they share a common theme: the role of our number system. Each topic corresponds to our number system in some way. The nature of our number system plays a vital role in what determines what mathematics is in several ways. First, numbers can represent a ratio. When a young child learns to count, they generally start with one. Then we teach them to say two, then three, then four, and so on. The difference between two consecutive integers is 1. For this reason, we can use a counting system to distribute a set amount of items to a group; we have a system with a 1:1 ratio. This ratio not only allows us to count or distribute goods, but to calculate distance. We know that 5,280 feet is equivalent to one mile. In addition, our number system allows us to play with ratios other than 1:1. For example, instead of saying I am going to travel 15, 280 feet, we can say I am going to travel 10 miles. Now the ratio is 5,280:1. Whatever we do to the one side of the ratio, we need to do to the other. The nature of our number system is what allows us to represent large amounts of something in smaller terms and then do operations to both sides. It also allows us to generalize amounts. I can say that for every x number of people I will give two candies. So if there are 10x groups of people I will give 10(2) or 20 candies. In this way, we discovered algebra. Secondly, our number system does not change; it is reliable. It is vitally important that if 1+1=2 today, then 1+1=2 tomorrow. Because of this, we are able to establish truths about the area of a triangle, about the nature of multiplication, and about statements in general. This is where logic comes into play and this is why it is a part of our high school math curriculum. Consider the following statement: If you do your homework, then your grades will improve. We know this statement is false if we do our homework and our grades don’t improve. We call this concept math because it is based on claims we assume to be true, like numbers. As long as we accept their truth, we can do proofs and make more discoveries about our number system. In addition to our number system not changing, it is also build-able and follows a pattern. We can think of a pattern or sequence of numbers on a graph but we can also think of them geometrically. Consider the sequence 1, 4, 9, 16,… On the graph this is represented by by y=x^2 when x<=1.We can also think of this as a pattern geometrically as the set of squares, the first being a 2×2, the second a 3×3, etc. When we take a simple pattern and make it a subset of another pattern, then we get a larger pattern which can also be presented by a pattern of shapes, or a tessellation. In this way, a pattern of numbers can represent more than one thing. They start with a small building block (most often one or zero) and either continue to grow or repeat.This is a fundamental idea in graph theory and sets. One other important feature of our number system is that it follows rules. In 630 AD, Brahmagupta finally defined zero as the result of subtracting a number from itself. From there, he came up with properties of our number system which today are formally known as the Additive Inverse Property, the Additive Identity Property, the Multiplicative Inverse Property, and the Multiplicative Identity. He also discovered that a negative times a negative equals a positive and a positive times a negative equals a negative. Some of these ideas are hard to grasp (specially negative times a negative), but they are what make our number system unique. Brahmagupta called negative numbers a “debt” or something one doesn’t have. However, this discovery allows us to think about patterns involving negative numbers and also helps us to solve for positive quantities. Finally, it is important that our number system does not only end with our imagination. It goes further; it reaches infinity. Without the idea of infinity, we would not have calculus. For example, when we take the volume of sphere using calculus, we need to break up a segment into the smallest sections we can imagine, then break those parts in half, and those parts in half until we get infinitely small sections. Although this is hard to imagine, we can perform these types of operations because our number system is testable beyond our limited domain and because our number system is reliable. In conclusion, the nature of mathematics is based on the characteristics of our number system. It is reliable, provable, and is applicable beyond our physical domain. One of the greatest tools we have today in mathematics is the ability to use previously proven ideas such as theorems in order to keep discovering more mathematics. This is exemplified in the mathematical findings done by the Greeks. They used the ideas of others as a stepping stone to develop their own, and these ideas were later used by other mathematicians such as Euclid and myself, specifically their discover of the deductive proof method. Although the Greeks adapted many of their ideas from the Romans and Egyptians, they were also able to develop some of their own. One of their most well known developments was in the field of Geometry. To begin, in roughly 600 BC Thales developed what is known as Thales Theorem which states that if one side of a triangle is the diameter of a circle, then that triangle is a right triangle. Thales also developed the Intercept Theorem which describes the similar areas created when parallel lines intersect to intersecting lines. During this time, the most well-known Greek mathematician, Pythagoras, also made substantial contributions to Geometry in Greece. Unknown to many, he was the first to think of math as a system. He realized that geometry could represent numbers. His most well known work is the Pythagorean Theorem which he developed using a rope. Although Thales and Pythagoras both in some way discovered geometry and made contributions to the field, Pythagoras is more well known. Later in the fifth century BC, a third important contributor to geometry, Hippocrates of Chios, surfaces. He worked on one of the three famous problems: constructing a square with an area equivalent to that of a given circle. His book entitled The Elements was written in 440 BC and highlighted the basics of geometry. Chios’ and The Elements were later used by Euclid. Also in the fifth century BC, Zeno of Elea used a version of the famous Tortoise and Hare story to come to develop the idea of infinity. He considered the following situation: If the tortoise starts the race ahead of Achilles, and the Achilles always catches up to the tortoise, how can the Achilles beat the tortoise? In theory, Achilles should have gained a little more distance between himself and the tortoise during the race until he was eventually within an infinitely small distance away from Achilles, but he never passed Achilles. This paradox was called the Dichotomy Paradox and it was used by Zeno to introduce the concept of infinity. Similarly, Democritus is thought to have come up with the idea of breaking a whole into smaller parts and again, dipping into the theory (at this point) of infinity during the late fifth and early fourth century BC. Instead of looking at the Dichotomy Paradox, he worked with volume and divided matter into cross-sections. Around 360 BC, Eudoxus of Cnidus, student of Plato whose focus was largely logic, developed a solution to find the volume of a prism by breaking it up into smaller sections. This may have also led to the idea of proportions he developed and irrational numbers. Later in the third century BC, Euclid used many of the ideas stated previously such as the Pythagorean Theorem, number theory, ratios of divided sections, and plane geometry in the various books he wrote. Euclid formalized and did further research in these areas which were first developed by the Greeks. Although the Greeks laid much of the groundwork, Euclid is the most well-known the work done in them. For example, we have Euclidean geometry and Non-Euclidean geometry. Even though the Greeks made many contributions to Euclid’s work, their greatest contribution to mathematics was developing a new method of proof. Previously, the Egyptians had used inductive reasoning and recurring patterns in developing truths in mathematics. The Greeks used rules of logic to prove and to disprove statements. This discovery is tremendous in the field of mathematics because it allows us to prove things that are not seemingly possible or imaginable. He did not prove this by guess and check, but proved it by using a series of true things. The deductive proof method lets us consider what happens when a process occurs an infinite amount of times, better known as taking the limit of something. We don’t know what the limit of an expression is as it approaches infinity because it would take us to long to get there. But we can use proofs to find out. In conclusion, the Greeks played a large role in the development of mathematics by discovering key groundwork ideas used by Euclid and other mathematicians. One of their greatest contributions was the deductive proof method which allows us to prove things beyond our physical domain. 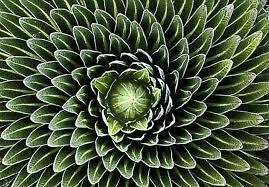 When I think of one of the underlying themes in math, I think of patterns. Even in the earliest forms of math when people unknowingly used it to decide how much food to prepare, they were forming a ratio of a certain amount of food per person and multiplying that amount by how many people there were. This is a pattern that begins with one unit and continues to the next. This is just one of the types of patterns in mathematics. I used to love math because it meant purely experiencing the joy of problem solving. This is probably why I like algebra. I enjoy taking a lot of information that sometimes seems unrelated to each, breaking it down into small pieces, and building it back up into one clean answer. It doesn’t matter how I got the the clean answer, but just that I got there. Math is problem solving. There are always multiple ways to find the solution, but a solution always exists even if it is the empty solution. Another reason I enjoy math is because I think it suits my learning style. With any new information I take in or learn, it is really important for me to first look at the big picture. From there I dive deeper into the topic looking at what things are related and connected. Math is like this in a sense that it takes big ideas and problems and breaks them down. It seeks to solve these problems by finding a pattern starting with the smallest details, and growing from there. These small details often form a pattern because of the logic or building blocks they are built on. Math is empirical; it is not founded on opinion or values. We can ask “what if?” and “what if not?” and are able to make solid consistent conclusions every time. The nature of the rules of logic is what allow us to find patterns in mathematics.